Maybe you already have a detailed mental image of your perfect shower system, complete with colors, styles and the ideal showerhead/faucet combo. Or maybe you have no idea where to get started. Either way, there’s no need to stress! Our design experts and sales representatives are committed to meeting your every need. If you’ve already decided on a design, we’ll help you find exactly the product that you need to match your dreams. If you’ve got a good idea of what your custom shower should look like, but are a little fuzz on some details, we can help you work those out. If this is all totally new to you, we’ll help you decide what sort of fashion and function would work best for your custom shower. With a huge selection on shower tiles, glass doors, shower heads, faucets. and much much more, we’ll help you make your perfect shower dreams into a reality - even if we have to help you figure out what they are first. 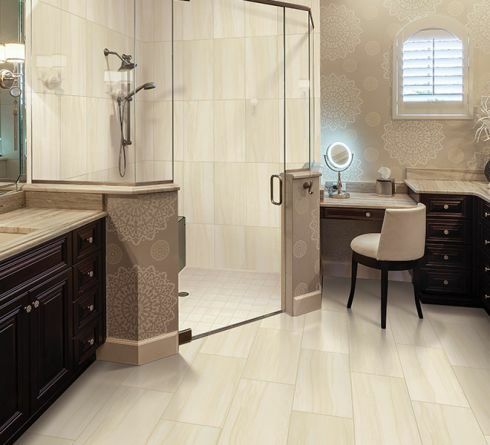 Natural stone tile: similar to ceramic and porcelain tile, but with an upscale edge that will add value to your shower. And when you shop with us, you’re guaranteed to get the best quality product for your money. We take pride in all of the materials that we have to offer. There’s nothing that can ruin your bathroom renovation faster than an incompetent installation team. Improper installation can lead to many of your materials breaking falling apart much more quickly and easily than they should, and can require costly repairs. Flooring N Beyond has years of experience installing custom showers, and you can rest assured that we’ll get the job done right. With design advice from our expert consultants, high-quality products from our huge selection, and expert installation from our experienced professionals, you’ll be able to rest assured that your shower will turn out exactly the way that you’ve been hoping. And with Flooring N Beyond, you’ll know you’re getting that great service for the best prices around. You deserve a custom shower completely tailored to your needs. Don’t settle for anything less!